Miss Fancy Pants, as she's known around the house, is a pup from Tzeitel's first litter born 06/05/2005. Sired by DC AFC NAFC Wildwoods Back With Zack MH, she has a powerhouse pedigree that is crammed full of of famous names - DC AFC Triad's Dry Martini CD MH, DC AFC Riverbend Deacon's Dandy CD VC ROM, FC AFC 2XNFC Fieldways Jack Daniels, DC Rebel Rouser ET ROM HOF, and DC AFC NFC Triad's XXIV Karat Oakleaf CD VC. 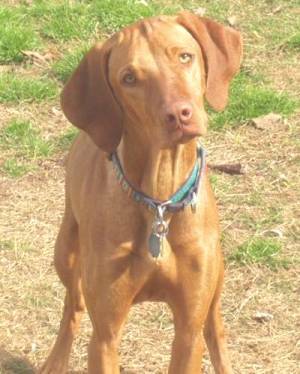 Fancy has been busy dabbling in all aspects of a well-rounded Vizsla's life. In the show ring, she only needs her majors to finish her AKC show championship. To date, she has earned 11 conformation points with multiple RWB, BOS, and 4 Best of Breed placements, several over specials. She has also earned her UKC Show Champion title - with two Group 3 and a Group 1 placement! She was ranked as the #4 Vizsla in UKC for 2007. 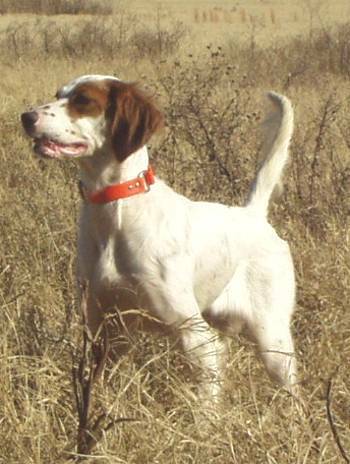 In the field, Fancy has earned some placements at all-breed trials and finished her JH title. She is very intense and stylish on point, and she LOVES BIRDS! She has spent time with our A-#1 trainer, Ray Dohse, becoming steady to wing and shot (i.e. "whoa-broke") and has been retrieve-trained. At home, she's a spoiled rotten momma's girl, like any good Vizsla should be!